I am not a neuropsychologist so I’ve let the left brain-logic/right brain-creative issue ride. After all, that sort of simplification is not going to kill anyone and it might just help sometimes. But with the increase in focus – via everything from apps and exercises to meditation – on hauling your right brain out from under its mossy rock to perform in public, I’m pleased to see a nice clear and competent article that puts the matter straight. One of the most fascinating insights from the split-brain studies was the way the left hemisphere made up stories to explain what the right hemisphere was up to. This is a short, easy read with no complex neuro-babble and it might just make it easier to give your right brain a break. A longer article might have discussed how left handers – some of whom have left/right brain functional reversal – fit into the picture. 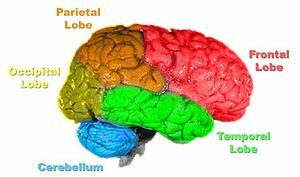 For instance, while language is largely represented in the left hemisphere in right handers, it is often located in the right for lefties, or even bi laterally represented. And visual stimuli aimed at the left occipital (visual) cortex and that right handers are unable to name, can often be identified by left handers. I found that out by messing up someone’s study as an undergraduate – reading words with my supposedly non verbal right brain and identifying images with my pictorially illiterate left. The article also doesn’t discuss the role of unconscious processing. Ever wondered how it is you arrive, when speaking, at the end of a sentence with all the words in more or less the right grammatical order even though you hadn’t planned out the sentence before you began speaking? That’s your unconscious doing its stuff. Abandoning the notion that only one side of the brain has anything to do with creativity frees us up to consider the value of the whole engine with its millions (maybe billions) of connections, all of which contribute to creative output. To me, that feels better than thinking I have to coax a shy genius out from under a blanket to make it dance. Interesting post, Suzanne, especially for me as I’m also sneaking bits of psychology into my writing blog. I’ve just found you on efiction and will be following for a while. Look forward to hearing more about your writing endeavours. What a coincidence – I just found my way back into eFiction following its overhaul and name change! I’m glad you like this post (and its more academic partner); the left brain/right brain simplification for writers has driven me nuts but there has never really been a neatly concise article to point to before that wasn’t just as daft! As one of those pesky left-handers, I’ve always been very interested in the left/right brain divide. As a special needs teacher, I found an unusually high number of lefties had significant problems learning to read and write. One of the interesting theories I came across to explain this, was the minor damage that was responsible for some of those children also rewired their brains, so while they were originally meant to be r/handed, they ended up as l/handed. And while in the population the percentage of l/handers remains a steady 10%, in my teacher training group, 8 out of 15 of us were l/handed… The first and only time we were a majority – and it was great! I’ve never been in the majority but as a psychology undergrad, I met more lefties than ever before – we were 25% of the group. It was good to be one of several; even better to mess up people’s experiments when they didn’t ask!